CLEVELAND, Ohio -- Progressive Field announced a long list of new offerings before the Cleveland Indians Home Opener and one of the most exciting sandwiches is one that has Flamin' Hot Cheetos on it. 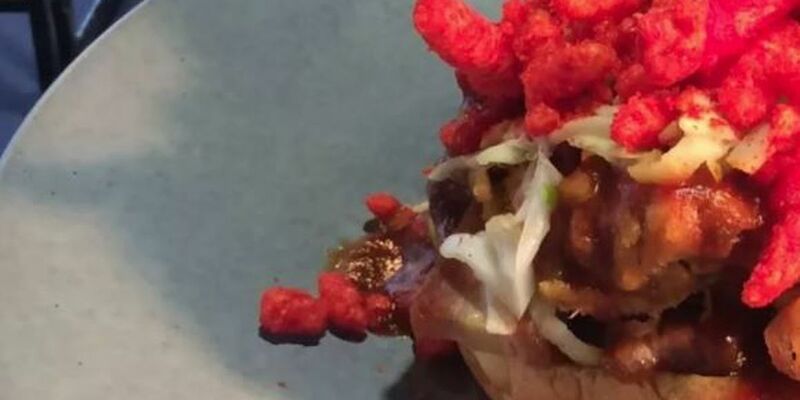 "I've been waiting two or three years to fit Flamin' Hot Cheetos into a dish," said the ballpark's new chef, Todd Brazile. He said he plans to enter the sandwich into a food festival in New York City this year. The new menu item can be ordered in the Terrance Club and at Throwing Smoke (section 160). It's called the Flamethrower. It's a pork belly and pulled pork sandwich topped with bacon jam, barbecue sauce, green apple slaw and Flamin' Hot Cheetos. North Coast Nachos: Fried kettle chips with steak or chicken, Great Lakes Dortmunder Gold, beer cheese sauce, salsa, sour cream, cilantro and green onion. Pop Fly Salad: Mixed greens, smoked gouda, strawberries, cherry tomatoes, candied pecans and poppy seed vinaigrette. Mac Daddy Dog: Premium jumbo all-beef hot dog, smoked bacon mac and cheese, pickled fresh jalapenos. Chicken and Tater Tot Waffles: Breaded spicy chicken, tater tot waffles with Applewood smoked bacon, cheddar cheese, chives, maple sour cream and Sriracha. "You have to stay on top of trends regardless. And that's what we do when we go to The Chicago Food Show. We have Twitter and all the social media where we try to keep up with what the fans want and try to monitor that," said Brazile. Plus, we must offer honorable mention to this coveted meat-on-a-stick snack: "Our friends at sugar dale are bringing bacon on a stick to Progressive Field. Everybody loves bacon, and it's so easy when it's on a stick so beginning opening day fans will get treated to bacon on a stick," said Curtis Danburg, with the Cleveland Indians.